We all know that workplace design affects productivity and work motivation, but its impact on the workflow doesn’t stop at the visual level. Unlike in the past, employees today won’t buy into lavish office trims and call it an ideal work environment: the features that business sharks want to see in their workplace now are closely linked to safety and comfort, not just aesthetics. The growing awareness of the effect of workplace ergonomics on wellbeing is fueling a change in office design. If you want to make your corporate HQ a hotbed of both employee satisfaction and peak output, here are some of the most important elements you should keep an eye out for. 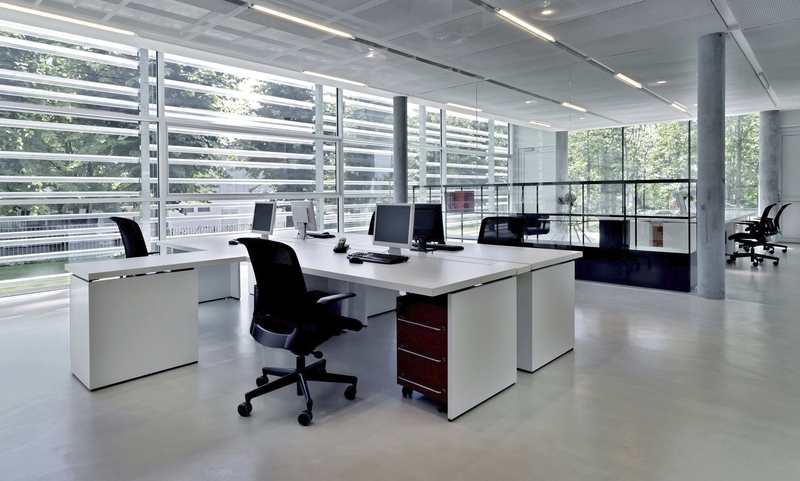 Lighting is one of the most critical workplace factors that impact output and employee comfort. Poor office lighting has been linked to increased sick leave frequency and productivity drops due to headaches and eye strain. If you want to ensure a steady and sustainable business growth, it would be a smart idea to swap standard lights for eco-friendly. Use of LED lighting in the office will help lower long-term energy bills while providing optimal brightness and even distribution of light required for peak focus and performance. For a cool bonus, LED light is also considered healthier than conventional ceiling fixtures, halogen bulbs, and incandescent or CFL lights. Air quality is another element of office design that can make or break business success. A recent study found that a single ventilation upgrade can improve work performance by up to 8%, which is why cash spent on state-of-the-art HEPA air purifiers will be an investment in long-term staff satisfaction and wellbeing, as well as peak productivity. Another simple way to freshen up the office air is to use houseplants such as aloe vera, dracaena, ficus, bamboo palms, and spider plants. A few pots placed at strategic spots around the office will be enough to plant the seeds of sustainable corporate success. Ergonomic workstations and chairs designed to support a healthy sitting posture, prevent back and neck soreness and other common problems linked to a sedentary lifestyle. This ensures a lower risk of occupational diseases that can compromise long-term performance. By replacing classic conference chairs with their comfort-fit counterparts with memory foam lining, you can hack increased work engagement and cut absenteeism by a single blow. Office materials also play a role in productivity and employee wellbeing. If you want to keep the staff healthy and productive, you shouldn’t skimp on flooring and furniture quality. As a general rule, natural materials such as wood and stone are the best option for a busy workplace. For this reason, you should allocate a part of the corporate budget for non-slip stone or wood flooring, purchase of timber workstations and filing cabinets, and similar features sourced from Mother Nature. Also, you shouldn’t forget to have the workplace tested for asbestos, carbon monoxide, radon, and other hazardous substances that can compromise employees’ health and contribute to performance dips and absenteeism. All work and little interaction is a shortcut to work motivation and performance nosedives. Employees’ emotional and psychological health is as important for performance as their physical wellbeing. This is why every business set on bringing peak profits home has to allocate a part of the office space to areas dedicated to interaction and casual exchange. Break rooms outfitted with comfortable seating, energy star appliances, coffee machines, and kitchenettes are a must-have, so don’t neglect leisure areas in your workplace if you want your staff to stay healthy and happy in the long run. A productive office is designed with employee health, comfort, and safety in mind: if your staff isn’t happy, it will show in performance metrics soon. The next time you decide to update the office, you should be guided by your staff’s wellbeing, first and foremost. Eco-friendly lighting, natural materials, indoor plants, ergonomic furniture, and break rooms are all pieces of the workplace puzzle that can make a difference between success and failure. If you want your business to rise to the top industry tiers, you should tend to the workplace design with due care and attention. Thanks to Chloe Taylor from SmoothDecorator.com, you now know the importance of having a healthy and safe workplace environment!